The Veronica 1W PLL first marketed in 1996 is still the favorite choice for broadcast engineers at all levels from the hobbyist through to the professional licensed operator. In early 1998 the PLL 2 was released and then in January 2000 the latest version was released, the PLL 3 'Easy-Tune™'. Without any amplifier tuning the PLL 3 produces a clean flat 1W output from 87 to 109 MHz, this is a match made in heaven for our high quality 12W and 25W variable output 'No-Tune™' RF power amplifiers. Reliability is now even better with an improved cooler running broadband RF output amplifier. The RF output device is rated at 1.8 watts, since the PLL 3 is running at only 1W, stabilty and ruggedness is excellent even at very high SWR. The audio signal to noise ratio is better than -80dBu, this is achieved by using a lightly loaded high stability half frequency push-pull Hartley oscillator for generating the RF signal. The output of the Hartley oscillator is configured as a frequency doubler using a push-push arrangement, filtered and amplified by two high stability amplifiers to 1 watt. All the parts for the 1W PLL 3 are readily available all over the world should you ever need spares. The PLL circuitry is 100% hardware controlled and will never suffer from software bugs or processor crashes. The ICs are the standard TTL 74... series and CMOS 4000 series. This PLL synthesizer is specially designed for high quality wideband FM with an audio frequency response that's near flat from 30Hz to 76KHz with selectable pre-emphasis. This important feature provides optimum stereo separation when used with a stereo coder. CD's and other audio sources are reproduced with the finest of clarity. As with the original PLL and the PLL 2 expensive test equipment is not required to set up the transmitter. Setting up the unit ready for broadcasting is made easy using the built in LED's that indicate power output and lock conditions. The Veronica PLL is known throughout the world as professional class equipment at excellent value for money. Thousands of stations throughout the world now use Veronica products for high quality broadcasting. You can be the streets DJ on your own radio station or listen to music on your radio from anywhere in the house with this kit. Students and enthusiasts can use the circuit for RF experiments. Some situations such as a field or stadium requires long wires for audio transfer, this may be time consuming and expensive. 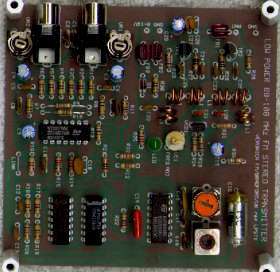 Eliminate such problems with this Low Power Transmitter and a standard FM Receiver. Power the circuit up and select a clear frequency between 88 and 108 MHz. Connect your Hi-fi, Mixer, CD player or anything with a standard line output to the audio input of this circuit and then you're on the airwaves. 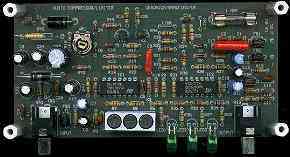 The audio input to the transmitter is adjustable which allows a loud distortion free signal to be set. A range of up to 500 metres is possible with the right antenna and power supply. The instructions include full details on maximising the range. Power for the transmitter can be batteries or a regulated mains adapter with a 6-16 volt output. Mains adapters will not cause any undesirable buzzing noises on the audio, all you will hear is clean crisp audio. Out of all the low cost transmitters available on the market, this beats them all in every respect. The technical specification is superior and the PCB and components are the highest of quality. Using the 19KHz pilot tone system this kit delivers performance only matched by the most expensive stereo coders. The single chip low power stereo transmitter designs available from other manufacturers are unreliable and unstable. These particular manufacturers quote 'high stability, high quality, professional performance etc', but always fail to commit themselves to publishing any true specifications. 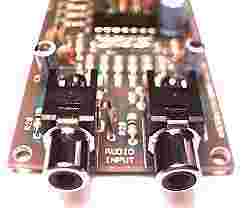 All the parts for this kit, including PCB are supplied, even the phono sockets, for easy hook up to your Hi Fi. Use of the kit includes stereo radio all around the house and beyond from your satellite receiver or Hi-fi. Just imagine you can listen to your favorite CD's in the bath or during a family barbecue. Please note that this product is not licensable for use with an antenna in the UK. This transmitter offers a bit more kick than our lower power model and is great for the beginner who requires a little more power. The kit is easy to build providing you are able to solder and read the instructions. Typical use's are a neighbourhood or village radio station. As with all our kits the audio quality is a match for any Hi Fi system. Should you require stereo or audio compression at a later date, this kit is suitable for use with our Crystal Stereo Coder and Limiter Compressor. 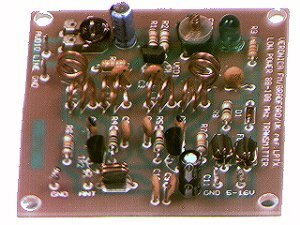 The RF connection is via a PCB mounted SO-239 at 50 ohm, included with the kit. Use of any normal 50 ohm SWR meter is possible, allowing a perfect match to be found. If this isn't enough, the circuit design includes an LED indicator as a tuning aid. The brighter the LED, the more power output there is, this makes tuning to any match dead easy. A 50 ohm dummy load comes with the kit for testing purpose's. A range of up to 2 miles is possible if used with a well mounted high quality tuned 50 ohm antenna. Make no mistake this is a genuine 5 watt RF output FM transmitting kit with a clean stable performance. When connected to a correctly matched antenna, broadcasts over an entire town or small city are possible. For testing and setting up, a 5 watt 50 ohm dummy load comes with the kit. The circuit design includes an LED indicator as a tuning aid. The brighter the LED, the more power output there is, this makes tuning to any match very simple. Alternatively, a standard 50 ohm SWR meter indicates the match more accurately. Kit includes all parts for a working model with PCB and large aluminum heatsink. PCB mounted audio phono/RCA and RF SO-239 sockets enable an easy connection to most types of equipment Just solder the kit together with a good quality soldering iron, apply a power supply and antenna, then play your music to the population. With this kit, you can convert your existing mono Veronica transmitter into a high quality FM stereo broadcast transmitter. The coder takes a separate left and right audio signal on two separate cables and combines them together to form just one signal coming out on one cable. This unique signal is called multiplex and can be fed into any mono Veronica transmitter. Any stereo tuner receiving this signal decodes the multiplex back into separate left and right audio signals. Stereo coder and receiver decoder synchronise to each other using a 19KHz pilot tone which is also added to the multiplex signal. Only the most expensive stereo coders will match the spec of this unit due to the pilot tone being crystal generated. For the first time high quality FM stereo is available to all, at low cost. This kit includes all parts, PCB and phono input and output sockets allowing easy hook up to your audio source and transmitter. No test equipment is required to set this unit up. In any sound broadcasting system the audio level must be controlled to prevent over modulation. The current trend is for broadcast stations to transmit a constant level of audio optimised to 100%. This gives the listener 'loud' audio and prevents constant re-adjustment on the receiver volume control. The Veronica Limiter Compressor is specifically designed to achieve constant 100% modulation without any over modulation using an FM broadcasting transmitter. The result is a professional sound on your station output with all music and speech inputs. The Limiter Compressor circuit operates the audio gain around 3 individual time constants. These control a smooth AGC combined with a very fast attack on audio signal peaks. Audio compression and output level are constant for input levels between -6dBu and +24dBu. 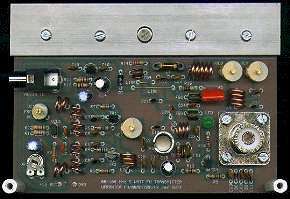 The limiter circuitry also includes built in pre-emphasis. Some audio equipment, usually CD players output high frequency signals above the audio spectrum. Signals such as these entering a transmitter or stereo coder are very undesirable and cause many problems. The Veronica Limiter Compressor is correctly fitted with a 15KHz brick wall low pass filter to block the high frequencies.